This is one vegetable I don't eat as often as I should. This sounds wonderful! This looks great. I'm pretty enamored with aubergines myself. What would you suggest I serve it with? I think we are on similar wavelengths because this is just the type of meal I want these days, simple, hearty and comforting. This seems like something that I can sit down with after a long day and really feel like I have had a break. I can't wait to try it. Ahh, my favorite vegetable! Such a comforting meal! 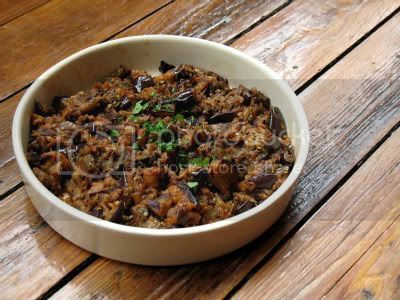 I love aubergines too, another great dish Sylvie! Nice Salad! I really like vegetable salads like these! It does look lovely and you are right it is an under-rated vegetable. I used to hate aubergine as a child (memories of soggy moussaka - urgh!) but now I love it! Karola makes a great aubergine and onion spread. It's most yummy. She roasts the aubergine over a flame until they're burned to nothing, then she scrapes them out. She finely chops then whizzes some white onion (not red as it comes out all brown and yucky looking) and mixes it with the augergine goo. Sometimes she adds mayo to the mix for extra nice bread spreading goodness. Deborah, I didn't eat aubergine a lot for years, but now I have it probably once a week in some form or other. Marie, we're still waiting for the first frost too. Can't be far off though. Marisa and The Curiouscat it'd be good just with bread as a light snack, but it would also go well with lamb or chicken I imagine. I had the leftovers in a wrap with salad and hummus the next day. Frenchie, if you try it I hope you'll enjoy it as much as I did. Irene, it's on y top ten list of vegetables too. Kevin, they make a nice change from the norm. Alex, I love moussaka. Maybe that's because I just never experienced a soggy one though. Dave, thanks for sharing. Sounds great! That looks great! Talking of comfort food, it would be lovely with mashed potatoes. Mmmmmm! I love aubergines ( called melongene in my country). Seems like we are of the same mindset as I have been eating lots of it as well. Aubergine is the king of vegetables.